Forensic Linguistics is the study of language and the law, covering topics from legal language and courtroom discourse to plagiarism. It also concerns the applied (forensic) linguist who is involved in providing evidence, as an expert, for the defence and prosecution, in areas as diverse as blackmail, trademarks and warning labels. 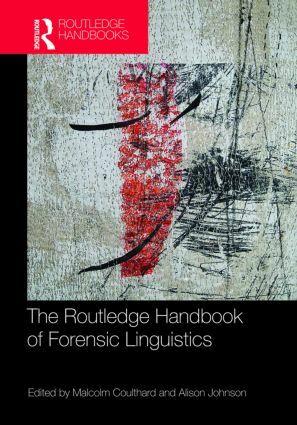 "This book is a theory-building contribution to forensic linguistics, valuable to scholars, practitioners and researchers in any of the areas of study of language and law: legal language, the language of the court and the judicial process, and language as evidence. Comprehensive, with many real data-driven examples, and full of methodological questions and answers; it deals with both the present dimensions and the new perspectives and challenges of this emerging discipline." new ideas and hybrid methodologies for future work in Forensic Linguistic analysis."